To be a leading innovator of technology products and services. To provide complete Technology Solutions to our clients that will help them grow there business. To serve like a partner to our clients providing the right technology to serve there clients. 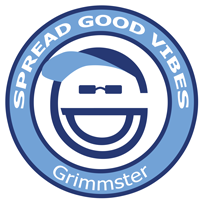 The Grimmster guy will be sharing more about Events and “Good Vibes” News, soon! Hey life is not all about work but if you can do what you really like to do then you are lucky. We like to have fun every day with the people we are around and talk to, either in person if we are lucky, or online. Since we tend to attract colorful people from colorful backgrounds we will convey these qualities to you in person or through the web. Transparency and authenticity are values we hold highly as they allow us to be the best at what we do. An attitude of generosity and caring by giving back in our daily lives where we can, is important. Ooh awesome! We get to see a lot of awesome people and awesome stuff. We want to pass along that same value to bring an exceptional experience to all those we work with and all that we do.